With thanks to the community effort in strimming and raking grass, the shorter, basic head and foot stones were made visible. The two weeks that followed saw daily visits to the graveyard. The site was divided into four sections radiating from a central point. 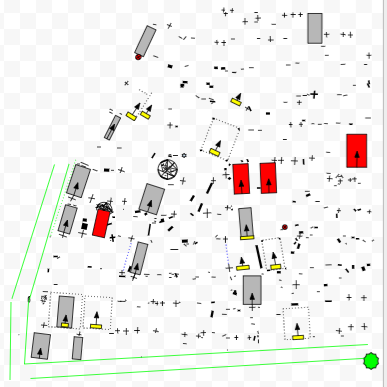 This method improves the overall accuracy of the finished map, by surveying one section at a time, plotting from the central point outwards. In the end the four areas will be pieced together and appear as one on the finished article. We began at the northwest section, mapping with pencil and grid paper, then later the results were plotted onto the laptop. However, it proved more efficient to ditch the paper and bring the laptop to the site. This, first, section of the graveyard is almost complete. Given that every single stone was recorded, on-screen it appears chaotic but the finished map will have greater coherence when various simple headstones are matched to their foot stones. Acknowledgement - The Fahan Heritage group are grateful to The Heritage Council of Ireland for their support and financial aid in getting this project out of the starting blocks.